(Bloomberg) -- European Commission President Jean-Claude Juncker stepped up his criticism of Chinese trade practices just days after President Xi Jinping sought to soothe European concerns in Paris. 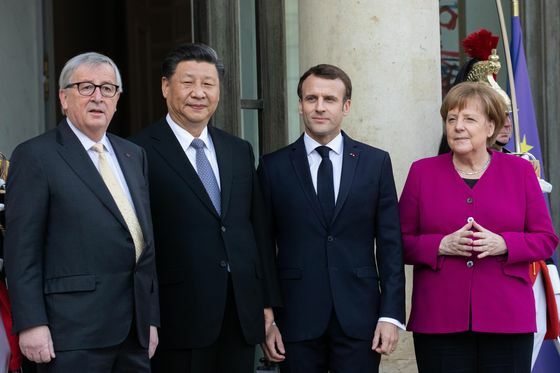 Europe has become more vocal in its criticism of China as of late, calling the country a partner as well as an economic competitor and a “systemic rival” on governance. Concerns are mounting over China’s growing influence, predatory investments and possible hacking of 5G data networks. Juncker said he’s not against the project “as long as the conditions are right.” If European companies can profit from it and “if you don’t only meet Chinese workers on these construction sites but also European workers, then this is all feasible,” he said. On a trip to Europe last month, Xi sought to lay to rest suspicions about his global plans.